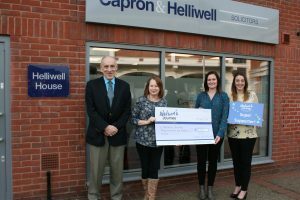 The lovely team at Capron & Helliwell chose to support Nelson’s Journey as their charity of the year in 2017, raising a fantastic £3,500 throughout the year from a series of local events. Sophie Berry went to collect the cheque from the solicitors office in Wroxham, on the 8th February, and enjoyed hearing about the fundraising that had taken place including a summer fete and yuletide market. The amount raised is enough to send 14 children and young people on one of our therapeutic Residential Weekends at Hilltop Outdoor Centre near Sheringham. On these interventions, children meet others who have also been bereaved, realise they are not alone in their grief, and learn coping mechanisms for their negative emotions. There is also lots of work done to remember the person who died, and they are an incredibly therapeutic experience for the children we support. Thank you and well done to all at Capron and Helliwell! http://www.nelsonsjourney.org.uk/wp-content/uploads/2017/05/logo.png 0 0 sophie http://www.nelsonsjourney.org.uk/wp-content/uploads/2017/05/logo.png sophie2018-02-21 14:24:172018-02-21 14:24:17Capron & Helliwell's fantastic year of fundraising!